Surrender at 20: Red Post Collection: Stats Tab now Live, Quick Gameplay Thoughts: August 3rd, & More! Today's red post collection includes the announcement for the release of the Stats tab, Meddler's quick gameplay thoughts for August 3rd, the Akali AMA on Reddit, and more! Red Post Collection: /Dev: Position Ranks in 2019, Quick Gameplay Thoughts July 27 & August 1st, & more! Pool Party 2018 - Pool Party Caitlyn, Gangplank and Zoe now available! "See how you stack up against players in different ranks. New performance based stats for your Summoner’s Rift games are in your profile now. Find out where your abilities surpass others and when you’re actually the reason for your losing streak. Choose a position or champion from the Stats tab to get started. Scores break down into three categories: Combat, Income, and Map Control. Those categories separate into both familiar data points and some new ones, highlighting exactly where you’re above or below other players. Say a Silver Mid Diana main wants to improve her gameplay. She opens her Stats tab and starts with her lowest score, Income. The detailed breakdown indicates average Diana players have a higher Early CS Advantage and CS Per Minute. She clicks a nasty dip and relives a game of chumming the water for Fizz. She watches pros CS against him to turn the tide of her early game income. Her next lowest score is Combat—her contribution to kills, assists, damage, and utility. Even in her highest Damage Share game, she’s still dealing consistently less damage to enemy champions than other Silver Mid Diana players. Dying in teamfights too soon or arriving too late keeps her from a higher damage output. Map Control is her best score. If she leverages her map-aware playstyle and starts placing wards in strategic places and roams, she’ll increase her Combat scores, and maybe one day get out of Silver. Get an idea of how you’re playing over a season or start leveling up specific skills. Start using Stats and let us know what you learn about yourself. At season start Stats fully resets. Games are measured from then until the next season begins. Will we ever see data for all previous seasons? No, we aren’t backfilling data from before midseason. Stats is best used as a performance based tool, and that depends on data being current. Is this a parity replacement for stats from the old client? It’s not, and it’s not meant to be. 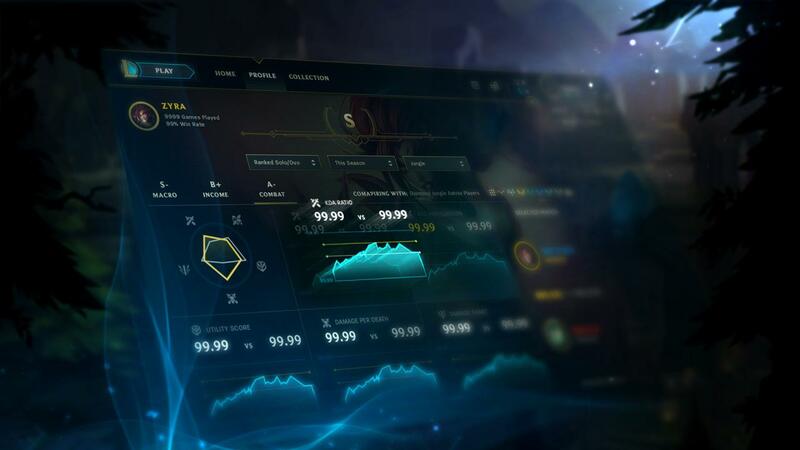 Last we spoke on it, we were exploring options around using stats to help you improve your game or show off your achievements and investment in League. Both angles are cool, but performance-improvement features tend to be more useful (and used) over time, so we steered today’s feature in that direction. We still think there’s room to improve on the achievement and investment side of the coin, but that would be something new rather than a perfect parity lifetime stats page like in the old client. Are my preseason games still measured after the season is over? Yes, you’ll see your games until the new season begins and Stats resets. Will ARAM or Treeline come to Stats? We’re not currently planning on showing stats for those queues. Will this data be available via Riot's API? Yes, we want you to have access to this data. We’re working on getting this out as soon as we can. When it’s live, it’ll show up on our dev site where you access Riot’s API." We've likely got scaling wrong on some Runes at least, with many values scaling both with level and ratio. That makes output particularly sensitive to snowball, rewarding leads all the more and making it harder to fight from behind. We've got a fix going through final testing at the moment for the bug where your own team's champions won't be correctly sorted on the tab screen. Original hope was to get that into 8.15, it ended up needing a bit more testing time than was available however. Should be in 8.16, apologies for the hassle on that one. Thanks for all the Nexus Blitz feedback so far. One of the most common themes we've seen is that some players are having really low frame rates, even though others (sometimes with what you'd expect to be slower computers) aren't having any problems at all. Given this is an non optimized alpha test that's not surprising, it does get in the way of gameplay testing though and of course is really annoying while you're playing. We're looking into it at the moment and it's one of our high priorities for the next round of Nexus Blitz improvements. Instead of a regular post mid next week we'll instead run through a summary of the issues we'll be tackling over the next few months. That'll include our current thinking on what we'll be looking to solve in preseason. Thoughts on that much appreciated, in particular given it's early enough we're still able to pivot quite a bit depending on what we learn." Some runes nerfs should be on PBE today. Looks more likely those will be in 8.16 than 8.17. Buffs to some tanks should also hit PBE today, with a focus on buffing the defenses on the tanks in question (Sion's HP stacking, Rammus's W, Naut's shield, Leona's W etc)." Hey Meddler, How do you feel about the current state of “Roaming Champions” in the mid lane? Do you think their ability to run away from the laning phase and snowball quickly from other lanes is unbalanced? I think some champs having roaming as a strength is overall really good for the game. It allows different team comps and individual playstyles. Also helps create variety in lanes when some champs roam much better than others (so it's not always shove versus shove, roam versus roam on equal footing etc). In terms of current power on those champs Quinn and Talon will get toned down a bit with the rune and potentially duskblade nerfs coming which I think's appropriate. Kled and ASol don't feel noticeably problematic to me." "We're expecting her performance to increase dramatically as people get used to her. Might give her a bit of extra MR in the near future, holding off on any other buffs though, try and avoid the overbuff." Aatrox sitting at 100% p/b in competitive on the current patch. Do you think it was a mistake to hotfix buff him twice so soon after release? He definitely seems like he'll need more follow-up work to power him down. Yeah, we certainly overbuffed Aatrox in retrospect. Being much more cautious with Akali to try and avoid that. Expect we'll do some balance work on Aatrox pretty soon (possibly 8.16)." Any considerations for more old items like sword of the divine on nexus blitz? We'll probably try some further old items out there. Do want to be careful about not introducing things that'll create problems, even in a less competitive mode, and about adding too much complexity though." Fizz we overbuffed and will be nerfing, still talking about whether to potentially hotfix on Monday or do so in 8.16. No immediate plans for Ahri." The Rioters responsible for updating Akali held an AMA over on Reddit! As usual, community member Spideraxe has provided a roundup of the answers! "EDIT: we're heading back to work! as always, some Rioters will stick around and continue to answer questions. Thanks for joining us, and we'll see you for the next one. The time for tradition is over, but an AMA is still a worthy challenge. We'll kick it off at 11:00 AM PDT and run until 2:00 PM PDT. Load up the comments with your questions and we'll come out from our shroud in a bit to answer as many as we can. So we do have a list of the colors (that's why you see them pop up), but it really depends. We don't look at our list of gem colors and say "We need a Ruby one." 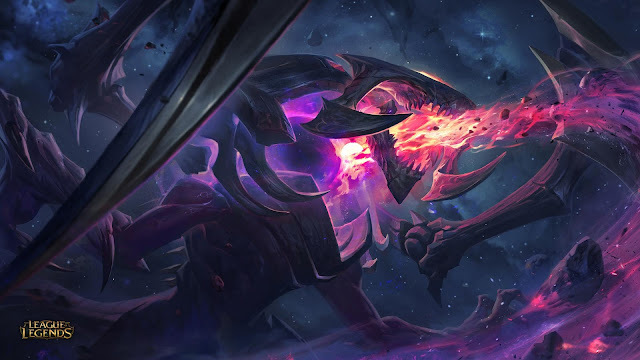 We generally start with a spread of different Chroma ideas and concepts which are decided based on the artist, some gut feelings, and the occasional "I think a Red Mecha Aurelion Sol would be awesome!" TL;DR: The Chroma comes first, the name comes second!"